Christmas season is only a couple of weeks away. Well, it’s time to start getting back in the festive spirit. Shopping malls are hanging their Christmas decorations and entire aisles have already been taken over by the red and green; business industries are also getting ready to make marketing strategies to increase their year-end sale. Whether you have been planning long before or haven’t thought about it until today, now is the time to start your Christmas marketing. Brochures are one of the influential factors in terms of marketing in business. They are inexpensive and super-effective marketing tools that can be used to boost holiday sales. We all have already received lots of Christmas brochures and seen Christmas promotion materials everywhere. But how can you make yours stand out from the crowd? Probably the best advice is to be creative. Don’t be afraid to try something new! But sometimes we find it difficult to be able to pour the whole idea into an attractive form of brochure design, because not everyone is adept at executing. 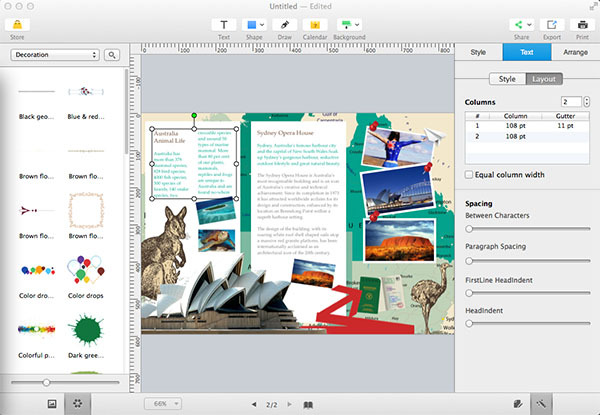 To solve the problem, you can learn how to make brochure by finding some brochure designs that already exist as a reference from powerful desktop publishing app. 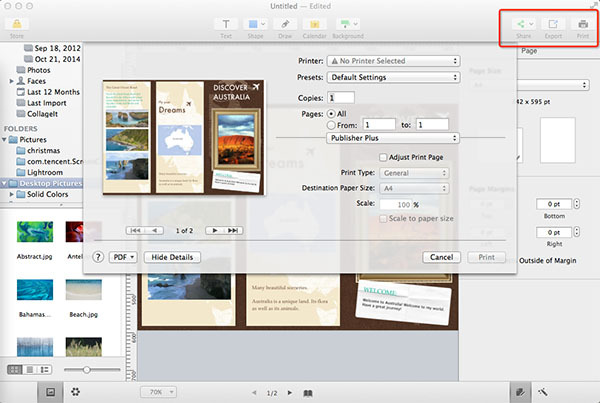 Publisher Plus is exact the one you need to have a try. 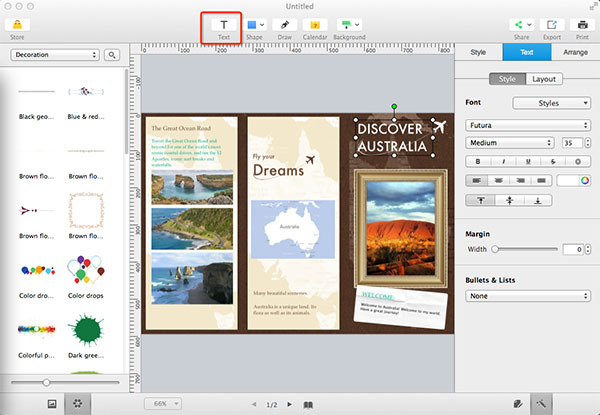 Here are the brief steps to inspire your ideas in making brochure design. 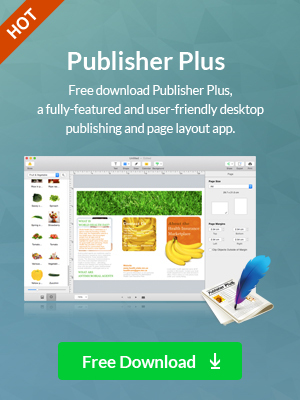 Start by launching Publisher Plus. You can choose a professionally designed template from the category of Brochure to start your design or just create a blank page if you have a well-thought-out plan in mind. Layout is an important initial guide for determining the position of text, images, or other design elements. 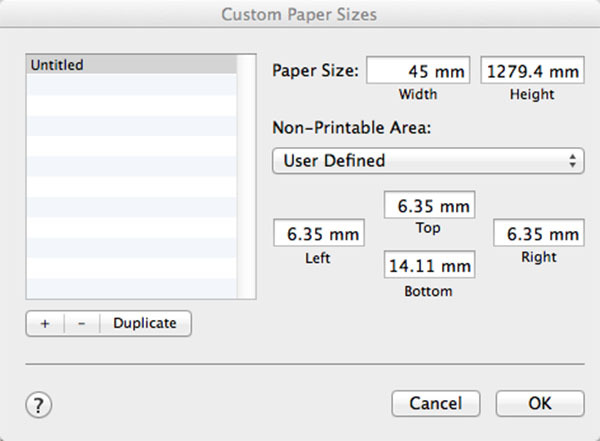 First choose the page size to fit your needs. If you don't see the desired one you want in the page size combo box, just go to menu File -> Page Setup to customize your own size. 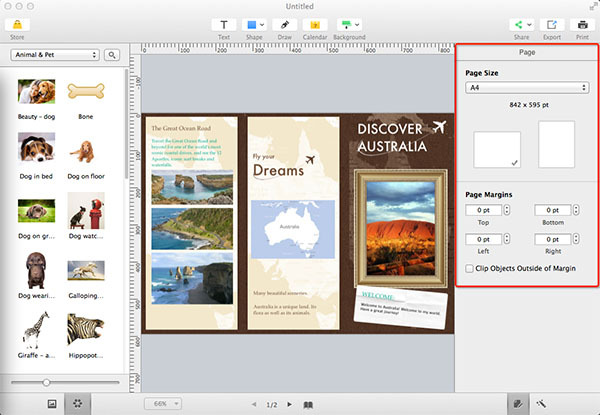 Determine the orientation of brochure page as Landscape or Portrait on the left page panel. Then to set the Margins for top, bottom, left and right at will. When you make a brochure, you take control on the flow of the information. Remember the content of the material must be perfectly arranged. Click Text toolbar on the top to add text objects into your work. An exciting headline is a nice complement to the brochure design. Write a short message and give it a prominent position in the document. Don’t forget to make it big and easily noticeable and choose some nice-looking font that works with the Christmas theme. Make sure that your brochure looks inviting to read. Do not overload it with information. Keep your sentences short and break up the text into small columns. Be sure to include the most essential information. 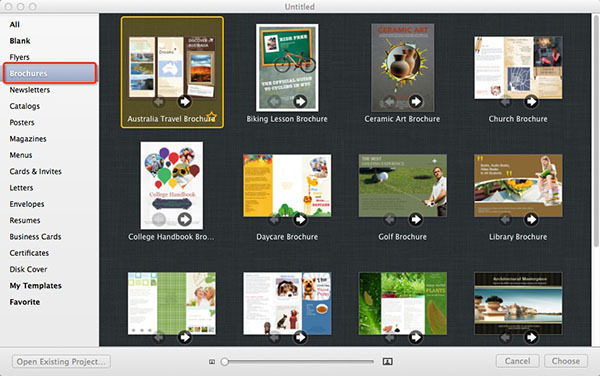 Pictures are very influential in supporting the content in a brochure, so it will be easy on the eyes. Use your strong call to action and eye catching images to make sure you stand out in a good way. Click the Clipart button to show the clipart list. 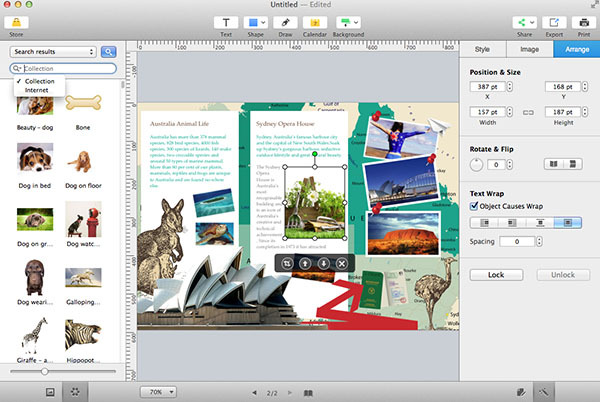 Drag & Drop a clipart to add it on the brochure page. If you don’t find clipart that you want, you can also search your desired one on the Internet inside the app. 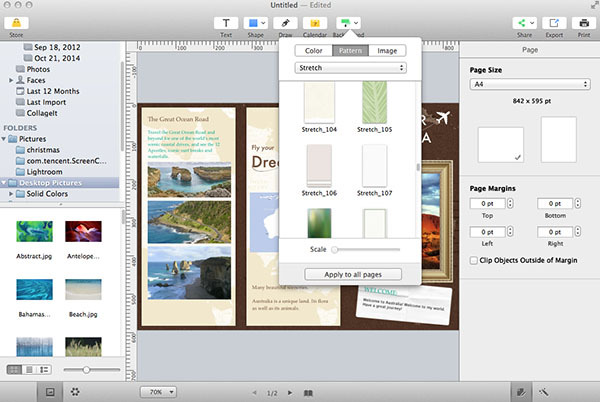 Stay on brand and use images that promote your product or service in style from your Mac finder or iPhoto, etc. Tips: Use high quality images or graphics to make sure you have the professional edge over your competitors. The right background can add more energy in your brochure. According to the overall style of your brochure, apply solid color, gradient color, preset pattern or your own image as background. Once the brochure is completed, go to the upper right corner and click Print to directly pint it out and send to clients. Also, you have options to simply share the brochure online via Email, Facebook, etc. Tips: Don’t forget to save your work periodically. Working your design to that end, you’ll be well on your way to a successful direct-marketing brochure that gets great results.